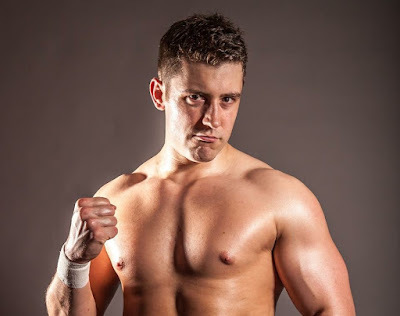 From the country's capital, Edinburgh, Joe Hendry (Local Hero) is a name that is fast becoming known for being one of the most gifted wrestlers in Scotland, if not the UK. From his dazzling entrances to his charismatic showmanship, Joe Hendry (Local Hero) has what it takes to be a future cornerstone of professional wrestling. 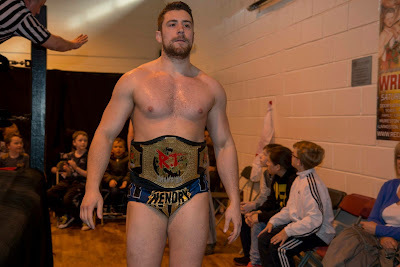 It's incredible to think that Joe Hendry (Local Hero) has been wrestling for less that five years, having already held many titles and having outstanding matches on a regular basis. It's little surprise that Joe possesses a jack of all trades ability to adapt to any opponent, using his power and size to muscle opponents, to using his technical ability and wrestling to twist opponents, something which has also seen him win a silver medal in amateur wrestling in 2015. His trophy cabinet is building up with titles from Reckless Intent, Scottish Wrestling Entertainment, Pride Wrestling, Scottish Wrestling Alliance and Pro Wrestling Ulster. Competing all over the UK from the North East of Scotland for Rock N Wrestle to down in England for Tidal, NGW, HOPE and Alpha Omega. Joe Hendry (Local Hero) has even been wrestling into Europe for RWA in Romania and PWU in Ireland. It's not down to just his flashy entrances, or his sharp promos, Joe Hendry is one of the hardest working wrestlers in the country. A true student of the game, Hendry regularly travels to seminars all over the country to learn from the best in the world. Something that Joe clearly strives to be. Through matches with the likes of Doug Williams, Crime Time and Damian O'Connor you can tell that Joe Hendry (Local Hero) absorbs so much information that flows over into this next match and his next and so on and so forth. Even from his early promos he gave an aura of invincibility and being a big deal. Not through being cocky, or looking down on others but in the presentation of his work. The man is a credit to Scottish professional wrestling. As his wrestling ability grows, so do the entrances. Never short on confidence, we've recently seen more creative entrances from Joe Hendry (Local Hero) in Insane Championship Wrestling, raising the ire of his opponents with parody entrances or find inventive ways to shoehorn his name into classic songs. In front of 4000 screaming fans in the SECC, we even saw Joe Hendry makes his entrance in a Hendry ball. You may've spotted Joe Hendry (Local Hero) on your TV screens having made appearances on WWE television as part of Adam Rose's Rosebuds, the pink suit cladded Hendry was grabbed by Jack Swagger during the segment, this lead to Joe Hendry (Local Hero) rename himself as no longer just a Local Hero but a Global Hero. He would return to our screens as Rusev's Russian advocate (along with Lionheart). With this strong build and great presence, it's hard not to think that Joe Hendry (Global Hero) is on WWE's radar. I have had the pleasure to watch Joe Hendry (Global Hero) compete in many promotions and I can safely say he is one of the best in the country. Much like the others that have been featured in this guest slot, he is another that is starting to really get his name out there and one that will be on everyones lips in the very near future. He has an "IT" Factor that draws you in and keeps you watching throughout. He can work the crowd to perfection and keep everyone entertained whether he wants you to boo or cheer. In the spirit of Christmas I will leave you with Joe Hendry's original Christmas gift.